After we published our December 2016 Echoes about the 1960 Donner Ridge Fire (pp. 4-6), a reader saw our article and contacted us. Ironically, he had completed writing a recollection of events fighting the Donner Ridge Fire. With his permission, you may read his story here. In our research about the Pullman Strike of 1894 and the role that Truckee played in that strike, the following are reference materials consulted for the article. * Harper's Weekly, 21 July 1894, "Some lessons of the Great Strike," pp. 674-77. Treachery Still to be Guarded Against." * San Francisco Call, Volume 76, Number 31, 1 July 1894 — A FULL STOP. [ARTICLE] A Full Stop. Blocked the Train at Fresno. Committee With the Wreck at the Trestle. * Sierra Sun, Doug Barrett, 23 May 1975, "Army had big role in Truckee." * Wikipedia - definition of "consist"
3. The ARU had been formed only a year earlier in June 1893. 4. Laurie explains that The Central Pacific had been a “military road” since the Act of 1 July 1892 and was entitled to federal military protection. Laurie, p. 129. 5. Other cities were Los Angeles, Bakersfield, San Jose, Stockton, San Francisco, Oakland, Sacramento, Port Costa and Dunsmuir. Guard, p. 3 . See books above. 6. In the United States, the term consist is used to describe the group of rail vehicles which make up a train. 7. 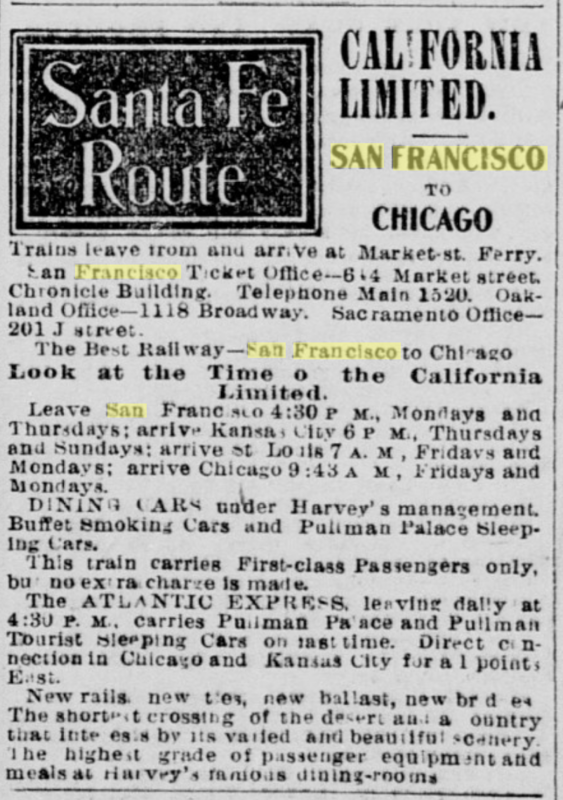 San Francisco Call, 20 November 1897, page 9, column 6 Pullman Palace Sleepers. Image of Advertisement. California Digital Newspaper Collection. In an effort to better understand the origins of the Pullman Strike of 1894, we also consulted the February 24, 1970 application for National Register of Historic Place Inventory - Nomination Form, Cook County, Illinois, then Form 10-300a (July 1969), for the Pullman Historic District, reference # 69000054. We located this in the ﻿NRHP Links 2015.xlsx﻿ and the form was prepared by Division of History, Office of Archeology and Historic Preservation, National Park Service Historian. In Section 8, Significance, pp. 275, 277, there is a very concise explanation of the cause of the Pullman Strike of 1894. A Memorial and biographical history of Northern California: containing a history of this important section of the Pacific Coast from the earliest period of its occupancy to the present time. Chicago, Lewis Pub. Co., 1891, p. 180, "[Truckee] became the principal point between Sacramento and Ogden." and "The business of Truckee has been confined to three articles, - lumber, wood and ice. The town is the third of the large towns of Nevada County, is located eat of the Sierra Nevadas, on the line of the central Pacific. In the vicinity are six saw-mills, manufacturing about 24,000,000 feet of lumber annually, mostly yellow pine." Truckee is a favorite stopping place for tourists, being in the 'heart of the Sierras'" and connected by stage to other interesting points. The author also stumbled on another book published in 1881, the Pacific Tourist, Frederick E. Shearer Adams & Bishop publishers (prefacing pages), in which there is a representative drawing of what the inside of one of the Pullman Palace Sleeper cars looked like.